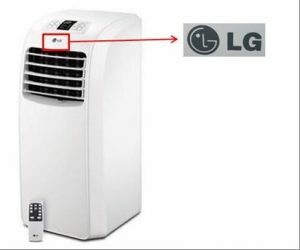 LG Air Conditioner. This one goes out to all you lucky people who live somewhere on the continent where it doesn’t snow—or maybe such a place doesn’t exist anymore. In any event, nearly half a million LG portable air conditioners are being recalled – just in time for Christmas – of course! Why, you ask? Funny thing, they can catch fire and cause property damage, burn down your house, maybe your neighbor’s, if the fire department doesn’t arrive in time, and possibly worse. You get the picture. I would say that’s a defect in the design, particularly given the idea is to cool down the surrounding environment – not cause a fire that could be seen from space. Apparently, LG has received four reports of fires that have caused a whopping $380,000 in property damage. Thankfully, no injuries have been reported. Here’s the skinny: the recall involves “about 466,000 (In addition, 36,000 were sold in Canada)”. There are three models of 7,000 and 8,000 BTU LG portable air conditioners including model numbers LP0711WNR, LP0813WNR, and LP0814WNR. The air conditioners are tan/white with the LG logo on the front. They measure about 30 inches tall, 12 inches wide and 14 inches deep and weigh 50 pounds. The model number is located on the product’s left side panel. Got all that? If you own one of these defective LG air conditioners, the company is offering to provide a free repair at an authorized service center. See the recall notice at the Consumer Product Safety Commission for more info. They were sold at Home Depot and other stores nationwide from February 2011 through August 2016 for between $250 and $280. Qbit Stroller. There’s another recall worth mentioning – this one goes out to all new parents who trustingly invested in an Aria Child Qbit Stroller. Say that after a couple of rum and eggnogs, I dare you. Apparently, the strollers have a defect that effectively means you, or possibly your child, could suffer a cut hand or broken wrist. Now that could really ruin your day, not to mention your child’s. Aria Child has received five reports of consumers being pinched by the stroller hinge mechanism resulting in four consumers needing stitches for cuts. In addition, there were 71 reports of the stroller unexpectedly folding during use, resulting in 12 minor bumps or bruises to a child or caregiver and one fractured wrist and elbow to an adult due to a fall. These strollers sound more like they’re possessed than defective. Here’s the relevant info – the gb Qbit lightweight stroller is meant for children up to 50 pounds. The recalled strollers have 4 sets of two wheels, a five-point harnessed restraint system, a full-sized reclining seat, a storage basket, a removable cup holder and a travel storage bag. It sounds better equipped than most hotel rooms. Oh – the strollers can also be used as a travel system with infant carriers. Probably not a good idea at this point. 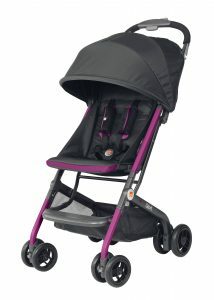 Here’s the skinny… “The strollers are mostly black with an accent color. “ (Mostly?- Who knows.) The “gb” red box logo is printed on the harness and on both sides of the stroller legs and “Qbit” is printed in white on the stroller legs. The model number and date of manufacture are printed on a sticker on the rear leg of the stroller, directly above the wheels, next to the storage basket. For a list of model numbers – check out the recall notice at the Consumer Product Safety Commission. Not surprisingly, consumers are being advised to immediately stop using the recalled strollers. Good advice. If you’re interested, you can contact Aria Child for a free replacement stroller. FYI – they were sold at Babies R US and other retail stores nationwide and Albeebaby.com, Amazon.com, Dmartstores.com, Medbroad.com and other online retailers from May 2015 through November 2016 for about $180. Exciting stuff… let’s hope they’re not under a Christmas tree near your this year. And on that note – Happy Holidays everyone! This was posted on Tuesday, December 20th, 2016 at 7:18 pm and is filed under Recall . Feel free to respond, or trackback. Read our comments policy.